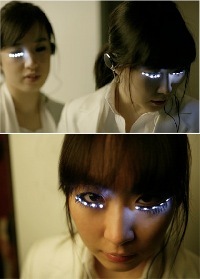 Girls, check this out – LED eyelashes could very well be the next big thing if you’re huge on fashion. After all, it sure as heck beats eyelash extensions that curl up like nobody’s business, and is a surefire way of attracting attention whenever you’re in a rave. Forget about glow sticks – this is the way to go. Soomi Parkl’s LED eyelash getup relies on a set of headphones to hold the tilt sensor as well as other electronic parts within, with spirit gum being used to affix it to your face.